If you remember the very first introduction of the Apple iPhone, you might recall Steve Jobs putting down the stylus, saying that the Apple iPhone uses the best pointing device in the world, your finger. From that moment on, Apple has never come close to embracing the stylus. That is, until now when the Cupertino based tech giant received a patent for the "Active Stylus". The "Active Stylus" is a stylus that does more than just help you input a touch on a screen. Your regular everyday stylus works by blocking electric lines. 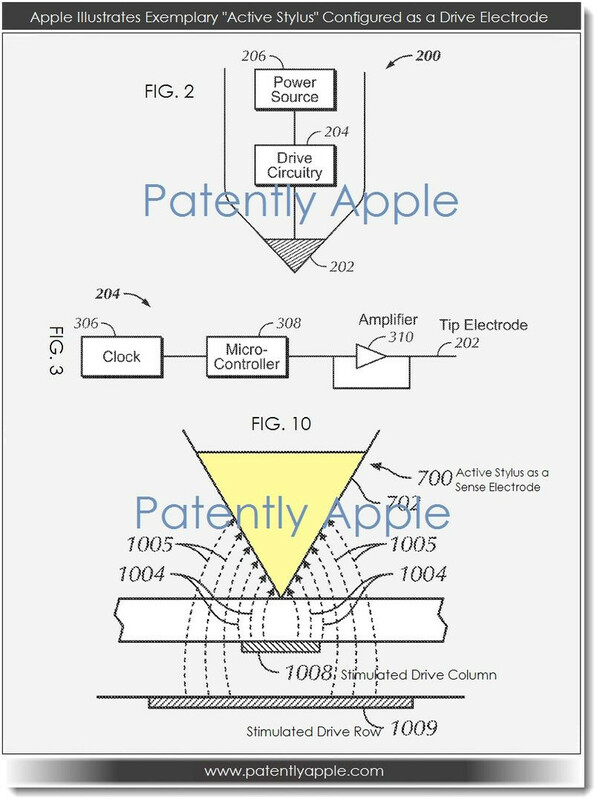 Instead of being passive, like the current stylus, Apple's tool would have the capability to create its own electronic field and couple signals with the main device. This could increase the speed and accuracy of the stylus and eliminate the lag that some S Pen users have complained about. Despite the lag, the S Pen has become extremely popular, so much so that speculation has Samsung including it with the Samsung Galaxy S IV. And we would say that the popularity of the S Pen comes from its ability to be more like a marker or a crayon rather than a touch input like Steve Jobs was thinking about when he dissed the stylus in 2007. While Apple listed the Apple iPhone and Apple iPad as a couple of devices that could benefit from the "Active Stylus," there is no guarantee that the device will soon be produced. But the guys in Cupertino could feel a lot of pressure to make the "Active Stylus" a reality if the Samsung Galaxy S IV supports the S Pen. I'm pretty sure Samsung patented updated S-Pen technology a while back that has yet to be implemented into its product line that would eliminate any of the lag problems with the S-Pen now. It will be interesting to see if Apple spins this to sound like they are revolutionizing the stylus. This is going to be a fight between hardware (iApple) and software (S-Pen). With processor power being so much greater than it was when the patent application was submitted, I suspect this is so much ado about nothing. With screen resolution of 441 ppi in the upcoming 1080p screens, software can be tuned to address any 'lag'. 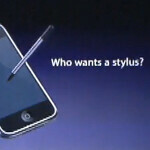 The 'active' stylus is more suited for low resolution (640x480?) applications. Huh? Active styli are nothing like using a capacitive stylus. So I'm not sure what you are saying here. You can't get the accuracy out of a capacitive stylus, that you can out of an active one. Capacitive stylus interrupts at the individual line level, right? If so, then software can be written to control the interruption events. If not, I still don't see active trumping capacitive, because the application developer just implements an OS feature for zooming, much like what is available with Chrome - if your finger clicks on two selection options, the selection immediately zooms in a dialog box for the user to choose from. Plus, how is the active stylus powered? Hearing aid batteries? It will be interesting to see if this Apple patent bumps up against any patents that Wacom has had for a while now. Also, I have yet to have any accuracy problems even with my first-generation Note. I am sure there will be even less problems if the Note III has this in it: http://www.patentbolt.com/2012/06/samsung-invents-next-generation-stylus-pen.html "The new stylus pen apparently uses the micro-current of the human body to allow the multi-touch screen to think it's a finger. This translates into the stylus pen having the same fluidity as you would get using your finger on a multitouch tablet yet with a finer tip. This could take out some of the lag that is traditionally associated with older generations of stylus pens." What Lag??!!! I am a proud owner of a Note 2 and I dont have any lag in my device so what the heck does this activ stylus provide that my S-Pen doesn't? And oh oh Apple finally going tthe Samsung way...i am definitely gonna be seeing the presentation for this device...and I will love it when Apple has to swallow its pride and make some crappy excuse for embracing the stylus and Oh My Dear Fans of the Fruit...how they're gonna be jumping up and down at the slim chance that they're getting to take a punch at the Note series...this is gonna be so funny I feel sorry for Apple and its loyal fruity pebble fan following! What Jobs said: "we INVENTED multitouch"? I just can't stop laughing. You shouldn't be, since that is fact. The inventors of multitouch started a company that is a wholly owned part of Apple, Inc. Apple holds THE multitouch patent. His point stands. Apple did not, in fact, invent multi touch. Steve Jobs lied. If thats the case...I guess we can say Google invented any patents they got in the Motorola deal, right? The S pen tech is a tech borrowed from Wacom. Wacom already got them patented years ago. It'll be produced, in a courtroom near you. This goes again Apple's MO. I think they just patented it as a bit of patent trolling against companies like Samsung that try to bring back the stylus. Can we say invalid (prior art)? Thank you broseph. You see Apple's name all over the history of pen computing. 0 Android companies in there. Tell me more about your plans to REVOLUTIONIZE the stylus Apple. Steve Jobs is tossing in his grave. iTroll Inc. When has prior art ever stopped Apple from suing?